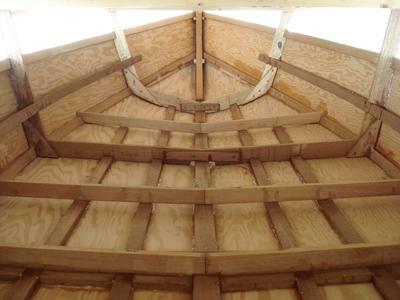 I'm building a ten foot, wooden rowboat and nearly ready to install the thwarts. The plans I'm working from are not real specific concerning the joint between the thwarts and the supporting risers. If layed straight across, the thwarts contact the risers on the corner of the risers, given the bend. This seems inappropriate to me for gluing and/or screwing the joint. What's the norm for this joint? Should I just take a rasp and flatten the top edge/corner of the riser so it has a small flat for contact? Lay a top plate with half inch over hang, like a beam and strong then lay your deck. As you pull it into place using the tea as a lock you get a deck you can remove, this is nice when it comes to clean out. Whatever you do enjoy, love to stray away from the plan, the T will give the boat strenth, its like an I beam if you run them up the sides it makes a place for the gun rail and long slats. It would seem to me that your instincts are correct. It’s difficult to say precisely without actually seeing the joint or the plan but any joint needs as much surface to surface contact as is possible. Judging from the photograph it looks like you are doing a great job on her so far.